Mail Order Manager Export addon designed to allow store owners to export orders from X-cart to Mail Order Manager software by Dydacomp. Orders can be exported to .dbf file that can be imported in M.O.M. using Order Import/Export module. Export/Import procedures are highly customizable, you can use filters to export orders filtered by some criteria.Import can be used to update order statuses as well as to create new orders at your store. 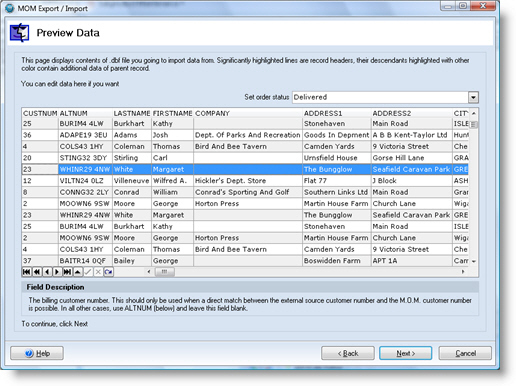 Mail Order Manager Export addon designed to allow store owners to export orders. ...... Multichannel Order Manager includes all of the basics to run your Ecommerce order taking and order processing business. * One Single Purchasing Function Handles Everything! Plus Many More Integrated Features! Do you need advanced email handling in your Windows 2000/XP applications? Email List management software. Provides rich set of functions and high speed. Qweas is providing links to Mail Order Manager Export 2.1.5.580 as a courtesy, and makes no representations regarding Mail Order Manager Export or any other applications or any information related thereto. Any questions, complaints or claims regarding this application Mail Order Manager Export 2.1.5.580 must be directed to the appropriate software vendor. You may click the publisher link of Mail Order Manager Export on the top of this page to get more details about the vendor.